binary digits which can be inserted directly into the telemetry stream. As an example, sensors which measure position often generate Gray-coded output by using a pattern of conducting and nonconducting surfaces with contacting brushes or, as in the case of the digital Sun sensor described in Section 6.1, a patterned mask or reticle and photocells. Analog sensors generate signals which vary continuously with the magnitude of the measured quantity. For telemetering, output from analog sensors must be converted from an analog to a digital form. This is accomplished by an analog-to-digital converter (ADC), sometimes simply called an encoder. The ADC generates a series of bits describing the magnitude of the analog sample being encoded. The format of the bits is determined by the characteristics of the ADC. Generally, an ADC generates one of the four signed binary codes shown in Table 8-6. Telemetry data transmitted from a spacecraft generally have little significance without knowledge of when the data were measured. Slowly varying quantities, such as information describing the mode of operation of the spacecraft or the telemetry format, do not need to be accurately time tagged; however, most attitude data change continuously with time as the spacecraft position and attitude change. Consequently it is important to accurately correlate telemetry data items with the time at which they entered the telemetry stream, i.e., the time at which they were transmitted in the case of real-time data, or the time at which they were recorded onboard the spacecraft for tape recorded playback data. Two methods of providing accurate timing are used: (1) "clocks" onboard the spacecraft, and (2) time tagging at a tracking or a receiving station. Spacecraft clocks measure time intervals, rather than absolute time. They normally consist of a piezoelectric crystal to which a known voltage is applied, causing oscillation at a constant frequency. Electronic circuits count the number of oscillations between two events and, hence, the elapsed time between them. In this sense, the crystal and its associated circuitry constitute a "clock." These mechanisms are used both to measure time intervals and to control the timing of spacecraft events. By using divider circuits, the effective output frequency of the oscillator can be decreased by successive factors of two to drive electronic components at lower frequencies. For example, this output is normally used to determine the rate at which telemetry data are sampled and transmitted. The spacecraft clock is generally activated shortly before launch and continues running indefinitely thereafter. Typically once per major or minor frame of telemetry data, the count of the clock is transmitted. After a time on Earth* has been associated with a spacecraft clock count, data received at other times can be correlated with Earth time by using the current spacecraft clock count and the known clock update frequency. 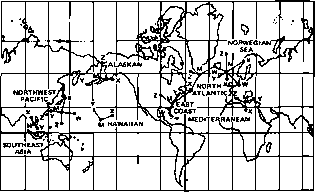 * Times attached on Earth are Coordinated Universal Time, or UTC, as broadcast by radio time stations. This is also referred to as Creenwhich Mean Time (GMT) or Zulu (Z). See Appendix J. Crystal oscillator frequencies drift due to aging and environmental effects such as temperature; for example, spacecraft clocks often run slightly faster when in sunlight than in shadow. To minimize such effects, the crystal is cut along a particular crystallographic axis and heaters stabilize its temperature. Other effects, such as magnetic fields and relativistic effects, are negligible for most applications. Spacecraft clocks are typically stable to 1 part in 1010 per orbit [Fang, 1975]. The count of the spacecraft clock can be altered by several occurrences, depending on the clock. The SEASAT clock can be reset to zero and thé oscillator adjusted to meet and maintain synchronization with GMT to within 100 jxsec. The register onboard the spacecraft which contains the clock count generally contains enough bits to allow the clock to run from several days to a year before it returns to zero, or rolls over. If the clock counts are in milliseconds, this requires 36 bits. 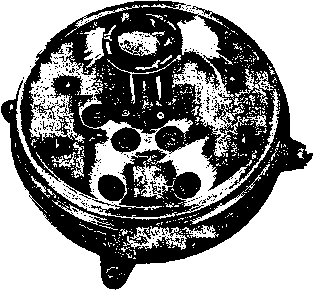 The SEASAT clock contains 40 bits, providing time steps of 30 ptsec. The count of the clock read into telemetry obviously gives only one time— usually the time of the beginning of a minor frame of data. If more accurate timing is required, ground software can use subblock time tagging to account for the time interval between the beginning of the minor frame and the time the critical data item was measured within the minor frame. This is often unnecessary for attitude data because times accurate to the nearest second are generally adequate. Both systematic and nonsystematic errors occur in the spacecraft clock reading. Systematic errors are caused by clock rollover or resetting. Nonsystematic errors, such as noise in the telemetry signal, can cause one or more bits in the clock count to be received incorrectly by a tracking station. In this case, randomly distributed times in the telemetry stream assume random values. This can generally be detected and corrected by ground software, as described in Section 9.1. Data received at ground tracking stations can be tagged with the local Greenwich Mean Time (GMT) at the time they are received by the station, or (for NASA-supported spacecraft) they can be transmitted in near real-time to an Operations Control Center (OCC) at Goddard Space Flight Center in Greenbelt, Maryland, where they are time tagged when they are received. In either case, the attached GMT consists of milliseconds of year at the time the data were received, or day of year and milliseconds of day. When the Information Processing Division (IPD) (see Section 8.1) at Goddard Space Flight Center processes data, the time tag always consists of day of year and milliseconds of day. Tune tagging to this accuracy is made feasible by the Long Range Navigation-C (Loran-C) timing network supported by the U.S. Coast Guard, the National Bureau of Standards, and the U.S. Naval Observatory in Washington, D.C. Coarse clock synchronization ( ± 1 sec) is accomplished via frequency and time signals transmitted by radio stations WWV and WWVH by the National Bureau of Standards, and fine synchronization is accomplished via signals transmitted by the U.S. Naval Observatory over the Loran-C network. These signals provide timing accuracy to 25 jisec, although improvement to ±2.5 /¿sec is anticipated in the late 1970s. The Loran-C network is important for spacecraft because it is the primary source of timekeeping for all of the Spaceflight Tracking and Data Network (STDN) tracking stations. In addition to STDN time tagging, Loran-C is used for navigation and aviation (its primary function), precise timing and frequency standards for industrial purposes such as crystal manufacturing, network synchronization for power companies, and scientific measurements such as very long baseline interferometry, pulsar frequencies, and Lunar laser ranging. Eight stations located around the world, called master stations, receive extremely accurate 100kHz timing signals from the U.S. Naval Observatory. Each of the master stations then transmits a 100-kHz signal to two or more Loran-C slave stations. Each master and slave group is called a chain. The eight chains in use as of 1972 are shown in Fig. 8-12 [Hefley, 1972]. The master station, M, in each chain transmits a group of eight pulses separated by 1 msec, followed by a 2-msec delay and a ninth pulse. The ninth pulse distinguishes the signal transmitted by the master station from those of the slaves (denoted X, Y, and Z, or W, X, Y, and Z) which contain only the initial eight pulses. When a slave station receives the wave train from the master station, it delays a preset time interval and transmits an eight-pulse signal similar to that received from the master. The preset delay is generated by on-site atomic clocks. A STDN tracking station receiving the pulse train from either a master or a slave station can determine time and time intervals to an accuracy of approximately 25 /tsec. The pulse trains transmitted by master and slave stations are shown in Fig. 8-13. The slave station delay times are such that a receiver within direct radio distance will always receive all of the slave transmissions before the next master transmission, and will receive slave transmissions in the same order: W first, followed by X, Y, and Z. Because the geocentric coordinates of the master or slave station being received are known, the time delay from the transmitter to the receiver can be calculated.